A Mini for the family | What Car? 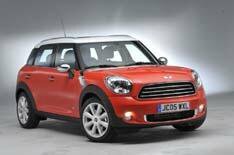 The Countryman is the largest Mini ever, and the first with four side doors and a tailgate. It adds a fourth model to a range that will become six-strong in the next few years, when the coup and roadster models enter production. It is also the only Mini to be built outside the UK: because the factory in the suburbs of Oxford is already working to capacity, production has been handed over to Magna Steyr in Austria, which used to build the BMW X3. With a raised floor, more upright windscreen, tougher-looking grille and lamps, and cladding around the wheelarches, its designed to look like a scaled-down SUV the cars ground clearance is also 10mm more than with any other Mini. Yet being a small off-roader isnt the Countrymans main role, even though three versions will be offered with part-time four-wheel drive. Primarily, it is for people who need more space than either the hatch or Clubman can offer. > Mini Countryman 6: click to enlargeIt is a Mini for people who want to start a family, says Jochen Goller, the head of Mini in the UK. We are not going to become an off-roader brand all of a sudden, but you only have to think back a few weeks to the weather we were having to see why we have introduced it. At just over four metres long, the Countryman is 40cm longer than the hatch and 16cm longer than a Clubman. With its higher roofline and raised seating position plus flat-folding split rear seats, its much more spacious and versatile than either. Youll be able to order it as a four- or five-seater for the same price, and it has one-third more boot space than a Clubman, expanding to almost 1200 litres with the rear seats down. Power comes from Peugeot-sourced 1.6-litre diesels (89bhp in the Mini One D and 110bhp in the Cooper D) and the latest versions of Minis home-grown 1.6-litre non-turbo and turbocharged petrol units (97bhp in the Mini One, 120bhp in the Cooper and 181bhp in the Cooper S). With stop-start and other fuel-saving measures as standard, even the worst of them averages nearly 45mpg in the official test cycle. The diesels CO2 emissions mean youll pay only 30 a year for road tax under the scales that came into force in April.